BAM! This stuff is D-LICIOUS! So addicting. 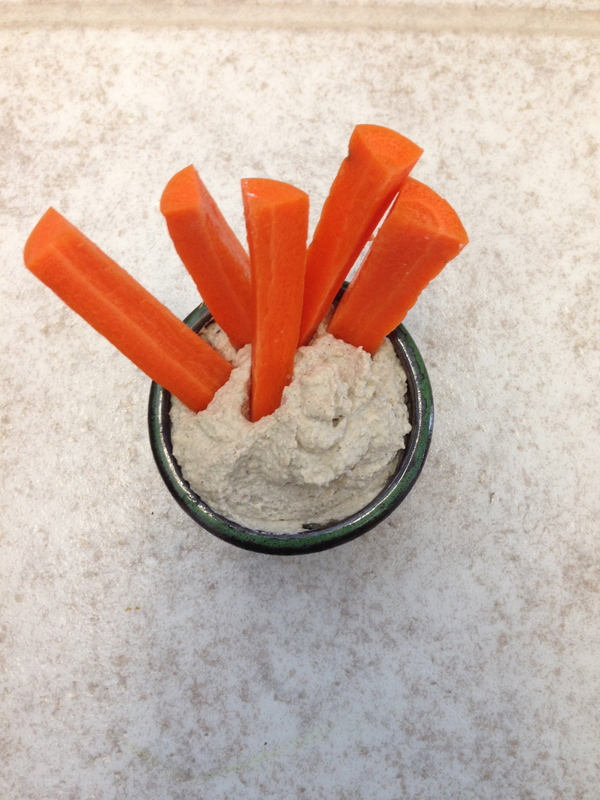 I’m a weirdo paleo-raw kid and I hate beans so I’m not a fan of regular hummus but it’s kind of a staple in the raw diet… I mean because it’s easy and it’s protein and you can dip veggies in it and you can top a salad with it. 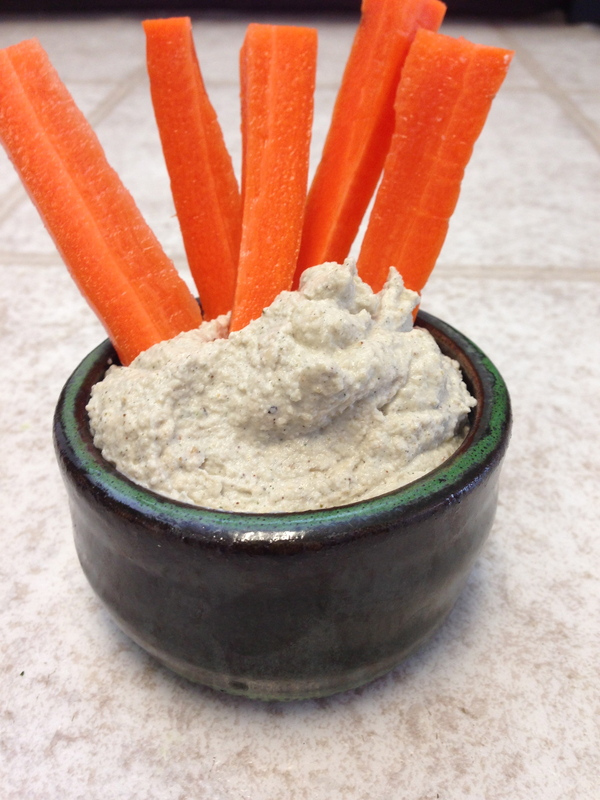 So I have been playing around with bean-free hummus recipes. I like the very popular zucchini hummus but for some reason I always get a headache after eating it. I’m thinking it is the zucchini. I like zucchini… a lot… so I ain’t trying to stop eating those anytime soon. But I’m trying to cut back. 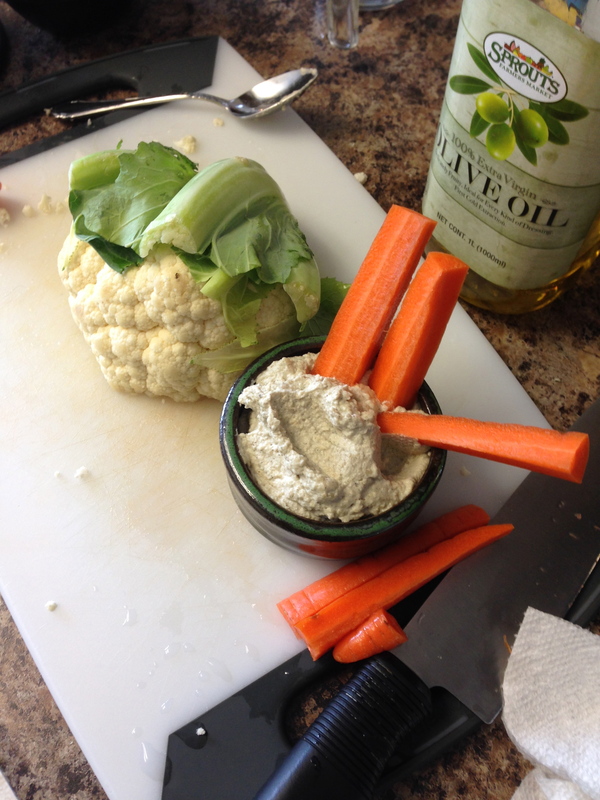 I thought cauliflower would be bomb in hummus because it gets smooth, has a mild flavor, and it’s just plain yummies. It is different form the traditional hummus (chickpeas+tahini+spices) in that I don’t use chickpeas (duh, we already addressed that!). Besides the cauliflower addition I also use hemp seeds (remember I’m obsessed from my previous post?) which add that protein punch. So we’ve got fiber from all the seeds (hemp and sesame) plus the cauliflower and now we have extra protein from the hemp seeds and lots of good fat so really what could be any better? Oh yeah, I also don’t use tahini, I use straight sesame seeds. 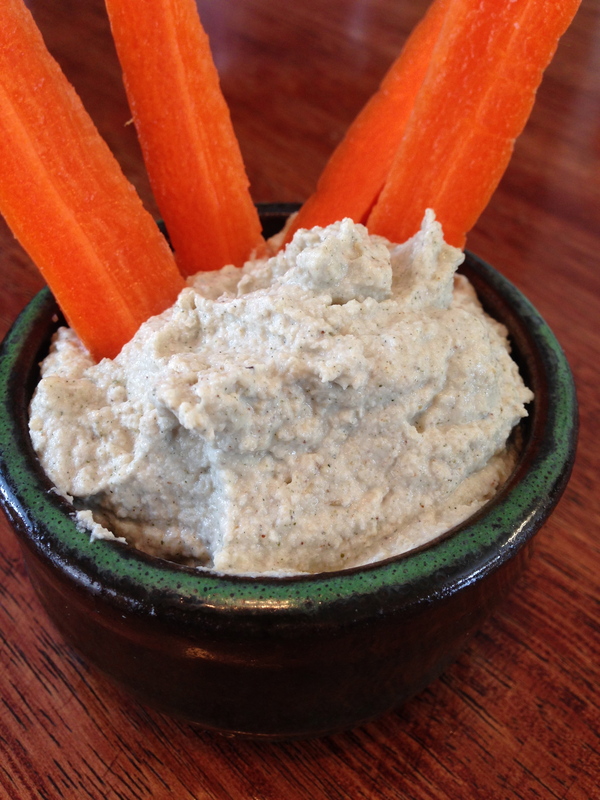 Tahini is made from sesame seeds (like any nut/seed butter) but I can’t for the life of me find RAW tahini anywhere! So I just use sesame seeds and grind ’em up to get that tahini-ness going ;). I don’t want to pay for shipping of a jar of raw tahini that I will go through in a week ($15+ for one week? nah!). First, gather your ingredients! You’ll need a knife and spoon, clearly. And obviously some cut up carrots to taste test along the way. Chop up your cauliflower and put it into the food processor along with everything else BUT only 1/4 cup of the water to start. Blend until smooth. Since you are using seeds (not already ground up, ready to go tahini) this can take some time, 5-10 minutes depending on your food processor. Scrape down the sides occasionally. You want a creamy, smooth texture. Add more water a little at a time if it seems to thick. Taste test. Salty enough? Cool then you are done! Now pour it in a bowl and try not to eat it all at once. I make a big batch on the weekends so I have hummus for the week for lunch and snacks. Now go make this so you can snack on it! Okay, it is time for me to peace out and go eat more of this… Don’t judge me. It’s so versatile thanks to its mild taste! I don’t understand why you don’t toast the unhulled sesame seeds in a skillet, Let cool then put in food processor to grind them then . 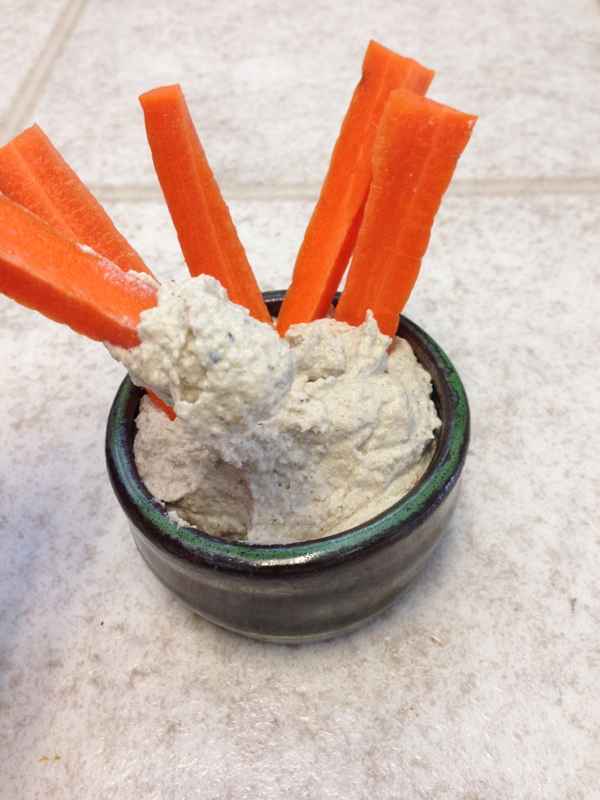 add the amount you need for your recipe to taste more like tahini in humus.? The recipe is RAW so toasting the sesame seeds would be cooking them and defeat the purpose of the recipe.